The first two games of the Stanley Cup Finals saw overtime winners scored by Justin Williams and Dustin Brown, the latter of which took place in a double overtime. The games were both unpredictable as the playoffs have been thus far and the series is likely to be. This makes calling the winner incredibly tight for anyone looking to place a bet. Up to this round, the Rangers had been 9-2 when scoring first and the Kings 3-6 when not scoring first. Both of these stats have not held up through the first two games of the finals. Within this chaotic random set of events that we call the Stanley Cup Finals, filled with weird bounces, edges lost and rolling pucks, is the daunting task of creating odds on the oddest of spectacles, top-notch hockey. The most common bet for the layman is simply: who will win the series? Regardless of the series outcome, these two teams will be defying history by playing the most games in the first three rounds of any cup winner and being the only cup winner to go seven games deep in the first two rounds. That being said, it is well known that the oddsmakers favor the Kings. Before the first game the Kings were a favorite across the board. They were at -155 favorite to win game one, a -170 to win the series and a relatively low 10-1 payout if you are confident enough to bet they will sweep the blueshirts. As for the second game on saturday night, the Rangers were the underdogs as the oddsmakers liked the Kings to take both home games. The goal total went over the projected line of 5 and the Rangers covered the away team 1.5 goal spread while losing on the money line. Both of these bets, moneyline and goalline, went to the favorite. Game 3 will see a change of venue and the Rangers being favored for the first time, no surprise there. 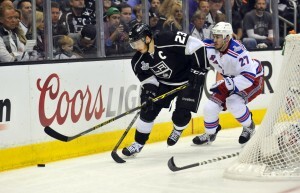 The Rangers are a favorite from -128 to -140 while the Kings are an underdog at +110 to +120. With the 1.5 spread, the Kings become favored as the oddsmakers like another close game and also like another 5 goal total. With all these markets to choose from it can be difficult for punters to choose what to bet on, a compromise may be the hockey themed slots game ‘Break away’. Break Away is an ice hockey themed slot game at Gaming Club that captures hockey in fairly graphic detail, making it perfect for anyone who is passionate about slots and ice hockey. It has no less than 243 pay lines and a spin feature that triggers additional game bonuses. The Break Away maximum jackpot is at the lower end of the online slot scale, at $500 but it still makes for a great alternative to sports betting.